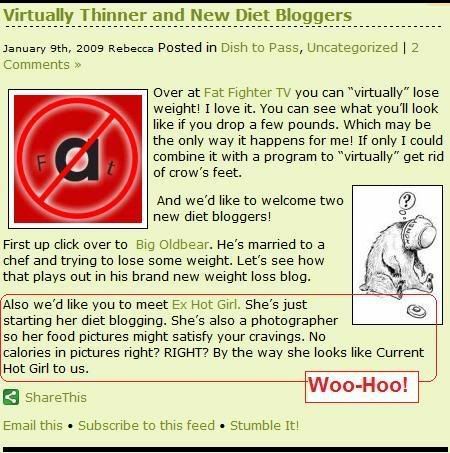 Ex Hot Girl: Does This Blog Make Us Look Fat? Okay, so I know I've mentioned my obsessive habit of searching for weight loss and/or diet blogs. I don't know exactly what it is, but something about knowing I'm not the only one out there really makes me feel happy. I have nosed around different forums before, and that doesn't quite do it for me for some reason. I think there's a whole other world going on with bloggers (Can I put myself in this category yet? I feel like I need to have been doing this for a year before I can call myself a "Blogger".) -- Bloggers have a different level of commitment and obsession with this thing. And, most of them (the good ones, at least) are writers. That in and of itself gets them into my good book. And, speaking of my good book, the fabulous folks down at Does This Blog Make US Look Fat? gave me a shout-out at their blog. I want to get noticed like that! Boo for me!